I stare at him sympathetically, and give the nearby waitress a nod (I’d ordered a couple extra Americanos just in case). 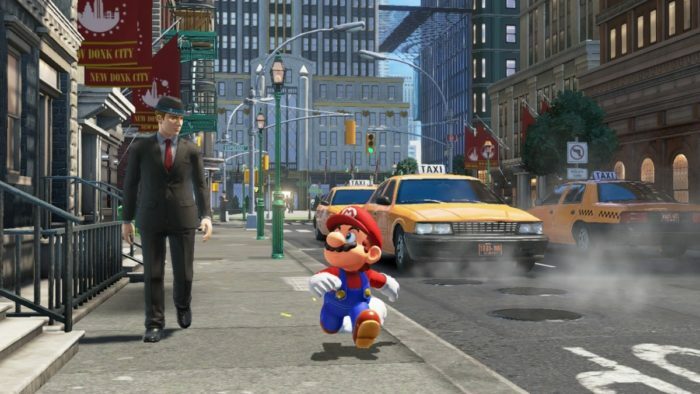 Mario’s eyes drift over to the window, gazing at the busy rush of yellow mechanical beasts weaving through the streets of New Donk City, and I know my time is short. He’s a busy man, and it was difficult enough securing this interview, so I start with whatever comes to mind. 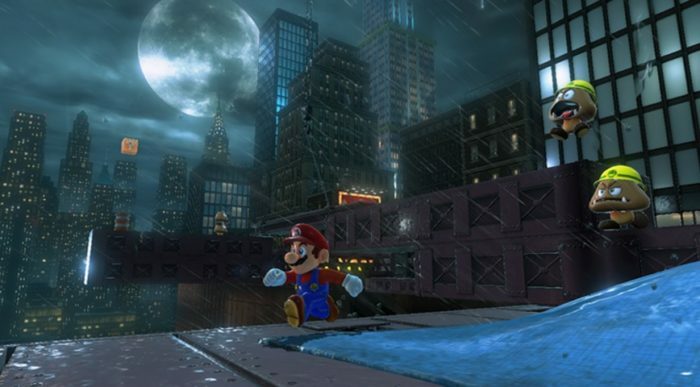 Gameranx: Mario, your latest adventure sees you in a sandbox style adventure in the middle of a big city. How do you feel about that? Mario: Well, mamma mia, it’s a been so long since my journeys across the galaxies, but wherever Peach go, Mario follow, you know? I mean, I just a finished Super Mario Run, and now, this had a to happen. We didn’t even get to eat the cake! But anyway, Mario have a bigger problem now. 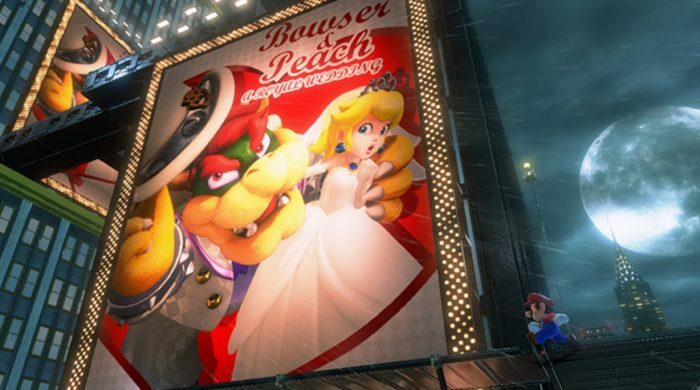 Bowser wants to marry Peach-ah! Oh no! Mario not scared. Mario seen Enchanted, he know how a to handle this. Mario gonna make Bowser into turtle pizza! Gameranx: Nintendo just announced their newest console, the Nintendo Switch. There are a few exciting games to look forward to, with Super Mario Odyssey among them. What can you tell us about the Switch? Mario: It’s a gonna be great! Mario gonna be in Super Mario Odyssey and Mario Kart 8 Deluxe. Lucky me, I get to sit down after all that running eh? Mario ran even more than Forrest Gump! Mario very tired, so driving is gonna be perfect, wahoo! Maybe even old Mario games a come back for the Switch, like Super Mario Bros. with Luigi. Mario Kart 8 Deluxe coming in April, but you gonna have to wait for Odyssey, Mario need a bit more time to find a Peach. Poor Princess…Bowser not gonna get away with this! At that moment, the waitress turns up with two scalding cups of the finest brew in the house. Mario’s face lights up. He grabs a cup, clinks it with mine and shouts saluti, before he downs the venti-sized beverage in one single gulp. Must be an Italian thing, I conclude, and quickly remember we’re in the middle of an interview. Gameranx: In the Super Mario Odyssey trailer, you’re wearing a special hat with googly eyes on it. What does it do? Mario: Okey dokey, Mario not allowed to tell a what exactly, but it’s gonna be special. Nintendo always give me fun new things to try, so I know the hat will be fun. Sometimes, I use it to get across buildings, haha! Si, Mario not like Spiderman, but I still gotta lots of cool abilities eh? I throw my hat like a frisbee, and it’s just a like a platform. Gameranx: Out of all the Mario games so far, which has been your favourite and why? Mario: Oh no, Mario not gonna answer that. Mario like all Mario games! But I tell a you what. Buy Mario a ravioli…and I tell you. Momentarily stunned, I call for the waitress and make the order. This could be a huge mistake, but I decide to risk it. I need this intel. Gameranx: Some fans have compared the open-world style of Super Mario Odyssey to Grand Theft Auto. What are the similarities, if any? Mario: Mamma mia, GTA? No, Mario not a violent! I’m a peaceful, only kill mushrooms and turtles and fish and blooper and piranha plant and shoot fireballs at everything. Odyssey happens in many locations, an airship, in the forest, lakes and bridges…and Mario come to the real world for the first time! Gameranx: Is there anything else you’d like to tell our readers? Mario: Mario number one! Pre-order my game here today! Only $59.99 USD from the Amazon! I’m about to thank him, but at that moment, the ravioli arrives. Before I even open my mouth, he’s swallowed the savoury dish whole, and is bolting out the door. Obviously, he had to run.